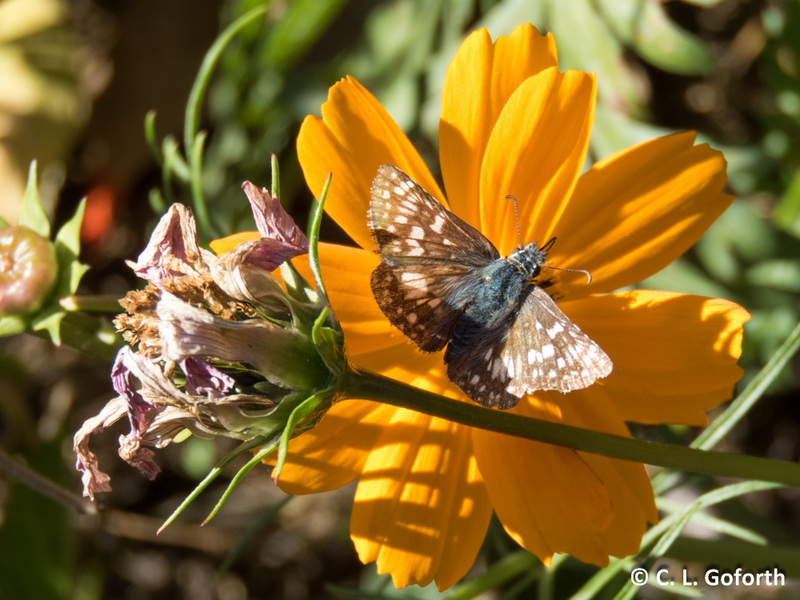 I don’t see a lot of these butterflies in general, so I was surprised – and very happy – to see one this late. So beautiful! The monarch butterfly is one of the most readily recognized and iconic butterfly species on the planet. 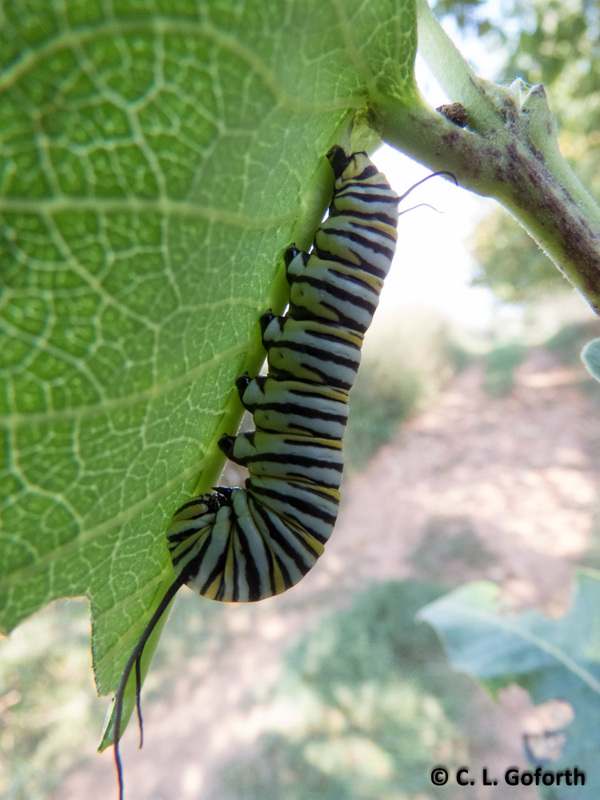 While for some insects we might not even know what the immature stage looks like, the monarch has been heavily researched for many years and we know more about how it develops from egg to adult better than most insect species. We have a lot of monarchs at the museum field station where I work, so today I’m going to share the life cycle of the monarch butterfly, every stage for this one. The tentacles on the front of the fourths are quite long, and about twice as long as those in the back. The tentacles are very long on the fifths! 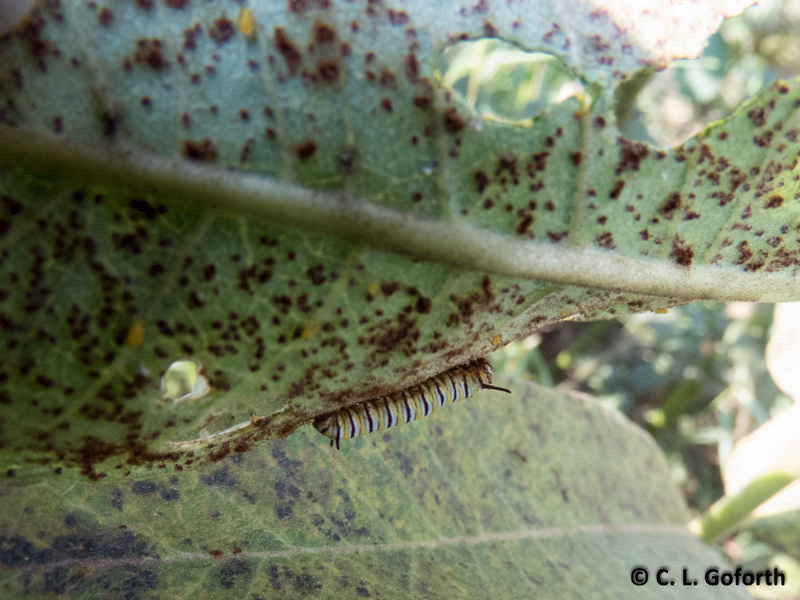 The caterpillars are also quite large, about the size of your pinky finger. They also have the color pattern most people most associate with monarch caterpillars, black, yellow, and white stripes and a striped head. Monarch pupae are gorgeous! Their pale green coloration helps them blend in with vegetation. They also have a line of metallic gold spots along one side. As they get closer to emerging as adults, the color changes. 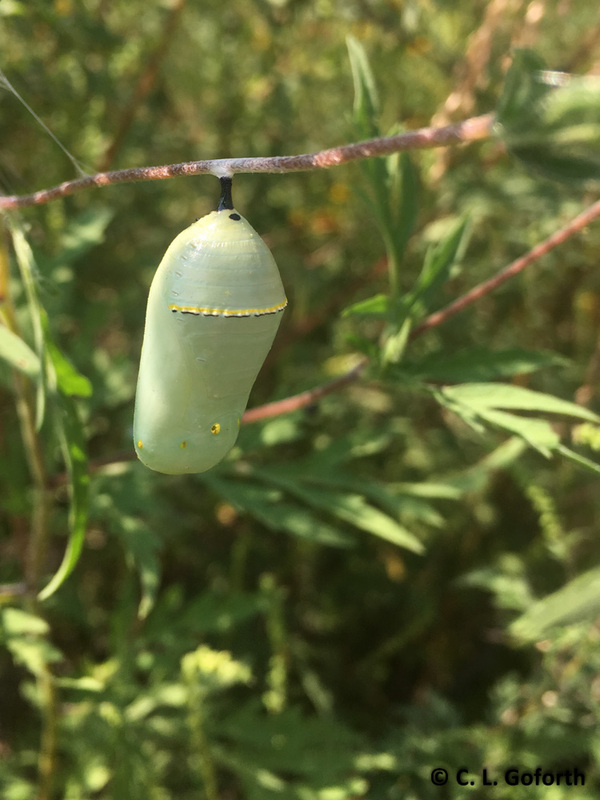 The exoskeleton of the pupa becomes transparent and you can see the black and orange of the monarch and the outline of different body parts tucked inside. The only change an adult undergoes is the loss of body parts. 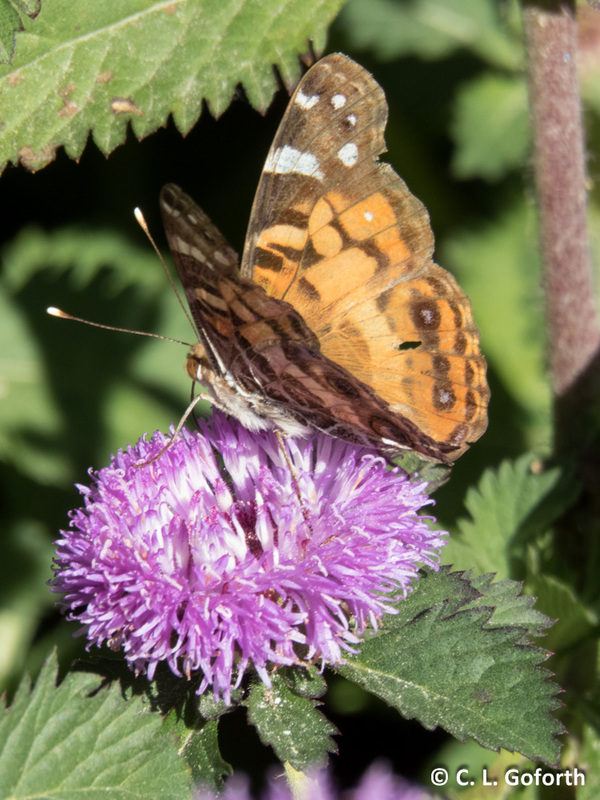 With butterflies, you can often get a good idea of whether it is young or old by looking at the wings. Complete wings with brightly colored scales tend to indicate younger adults. 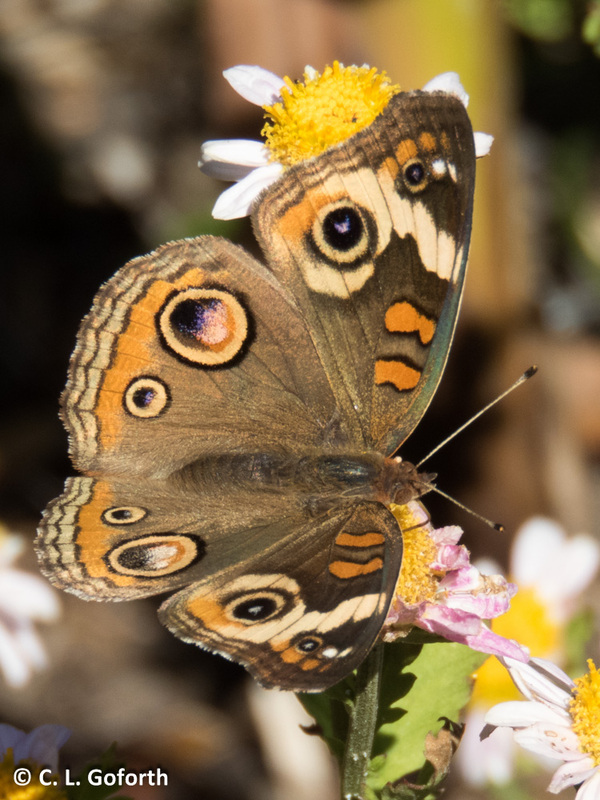 Tattered or missing wings and dull spots where scales have rubbed off generally mean you’re looking at a butterfly nearer the end of its life. 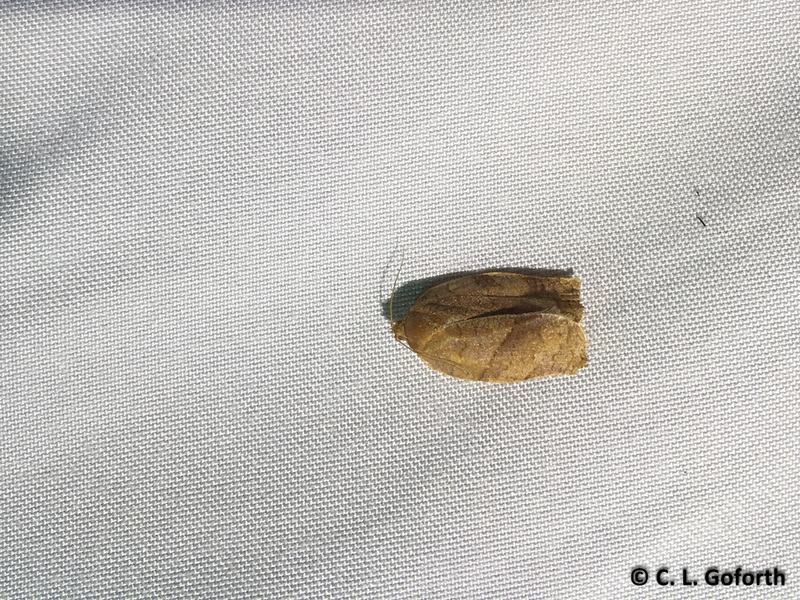 The female then lays an egg on the underside of a milkweed leaf. 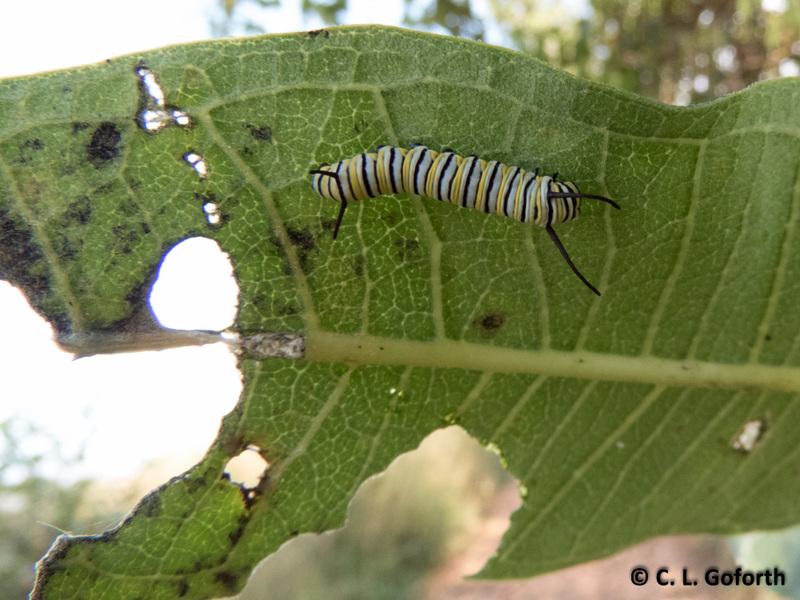 She will leave it behind to lay more, often on other milkweed plants. The caterpillars that hatch have to fend for themselves and ultimately only a small percentage will make it to the adult stage. 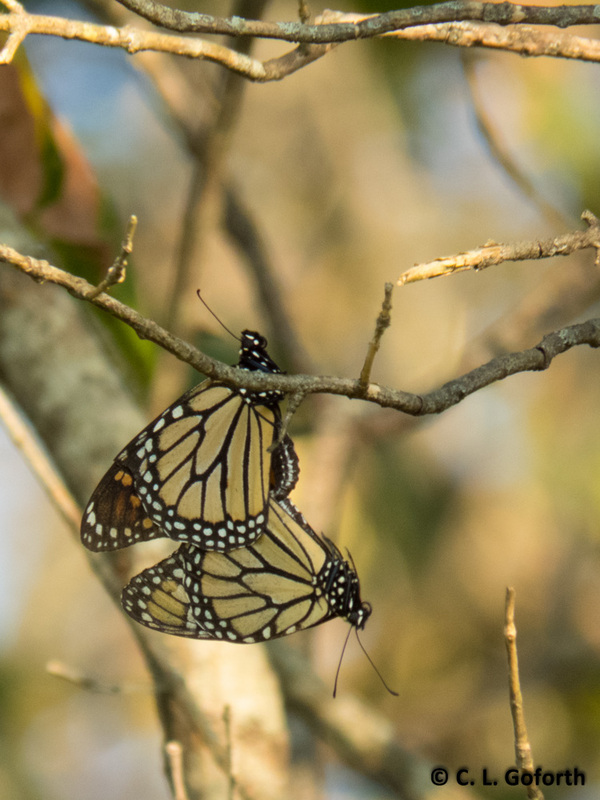 Monarchs have a very complicated yearly life cycle. I am not going to go into much detail here, but they have multiple generations a year. 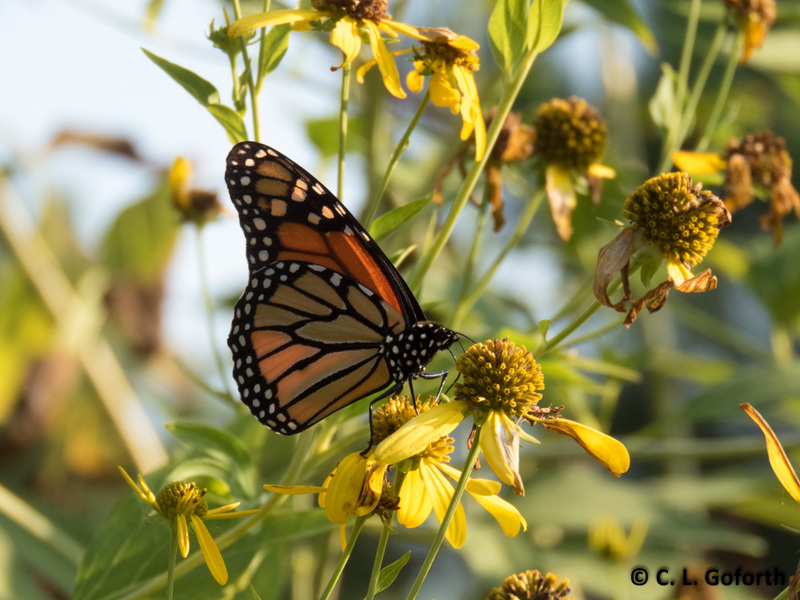 The monarchs that fly north from Mexico typically make it as far as Texas before they lay a bunch of eggs and die. 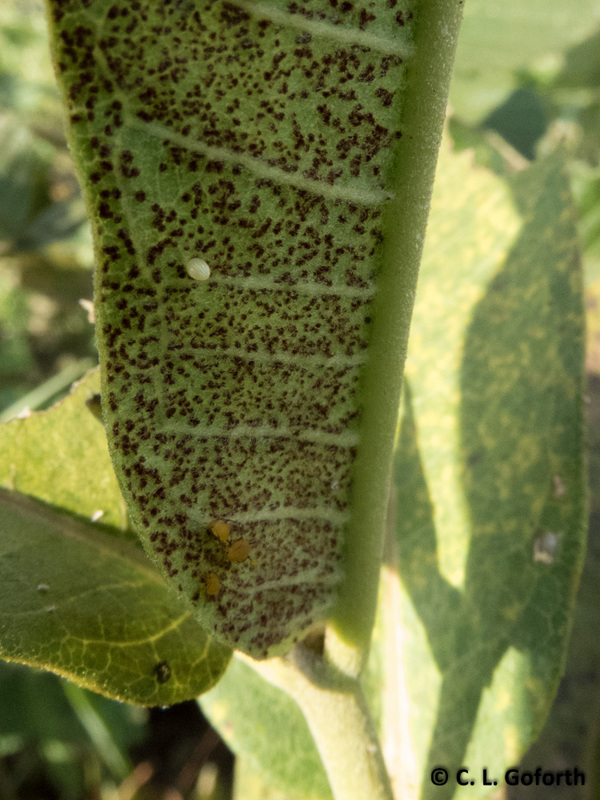 The monarchs that hatch from these eggs spread further north in search of milkweeds and nectar, and then they too lay eggs and die. This can happen one or two more times before a special generation is produced in late summer or early fall. This generation lives close to 6 months instead of just a few weeks and they are the ones that will fly to Mexico, overwinter there, and then fly back to the US in the spring. 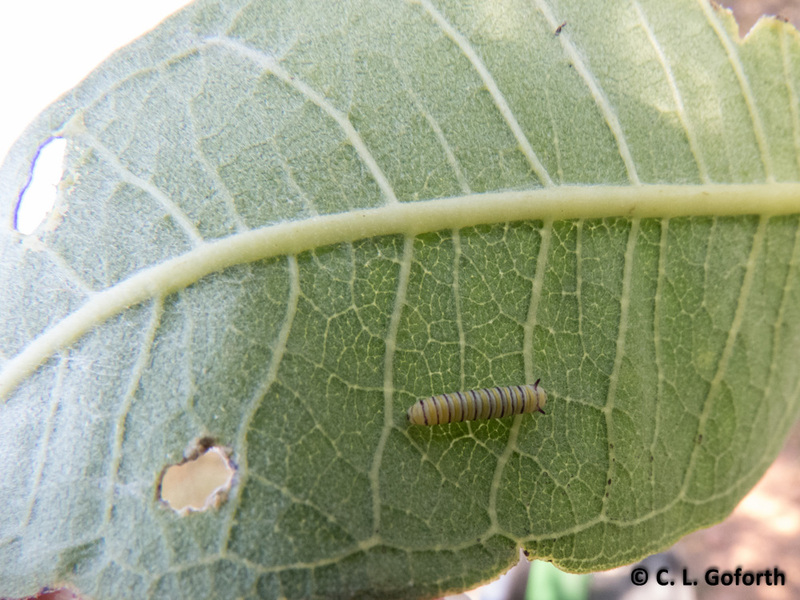 So there you have it: the complete monarch life cycle – and the first Life Stages post. Hope you enjoyed this one, and I’ll post another species soon! My last post about National Moth Week! Can you tell I really love this event? 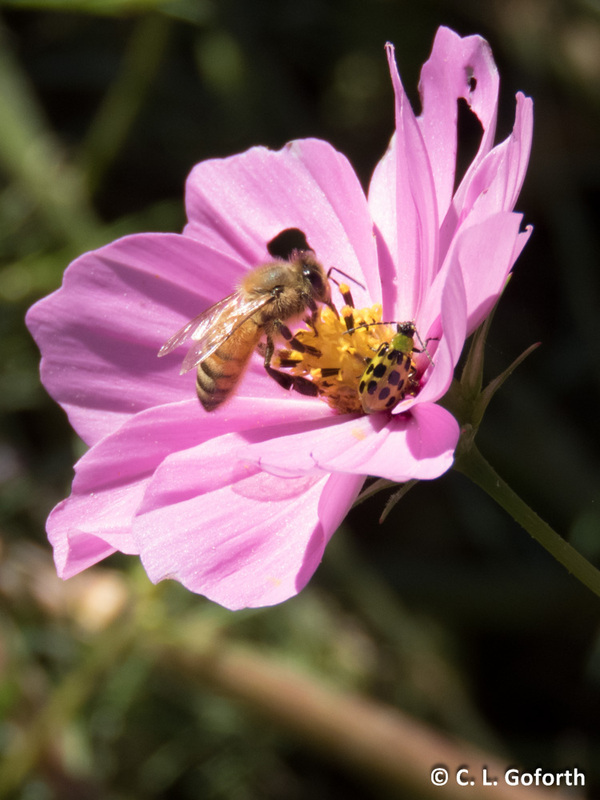 It gets me outside looking at bugs both at work and at home each year, so it’s a ton of fun. However, this year’s fun was greater than usual thanks to a couple of things, a great insect find and a photo I’m really pleased with. I saw it and started yelling, “Ooh, ooh, ooh!” and jumped around happily. If my neighbors didn’t already worry about me, that little episode probably convinced them I am nuts. However, I quickly came to my senses and took a whole bunch of photos of it. I knew it was something unusual, something I definitely haven’t ever seen before. Once I got a ton of photos, I ran inside and started looking through my field guides. It wasn’t in any of them, but that didn’t surprise me. It was so weird! I wasn’t even really sure what order it belonged to, but I thought Neuroptera (the net-winged insects) was the most likely. 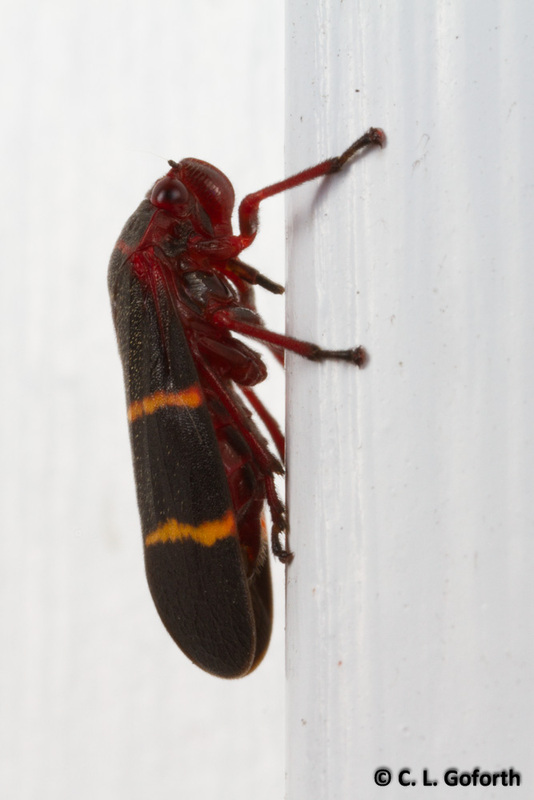 So, I started randomly clicking through all of the Neuroptera photos on BugGuide to see if I could find it. Happily I did! Family Dilaridae, the pleasing lacewings. Nallachius americanus specifically. 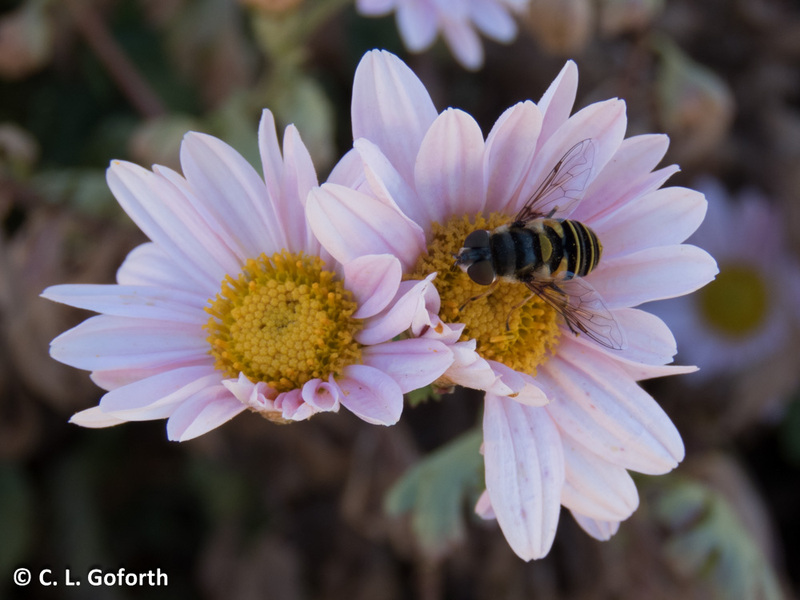 There are two species in the US (one is only found in Arizona) and about 70 species worldwide. 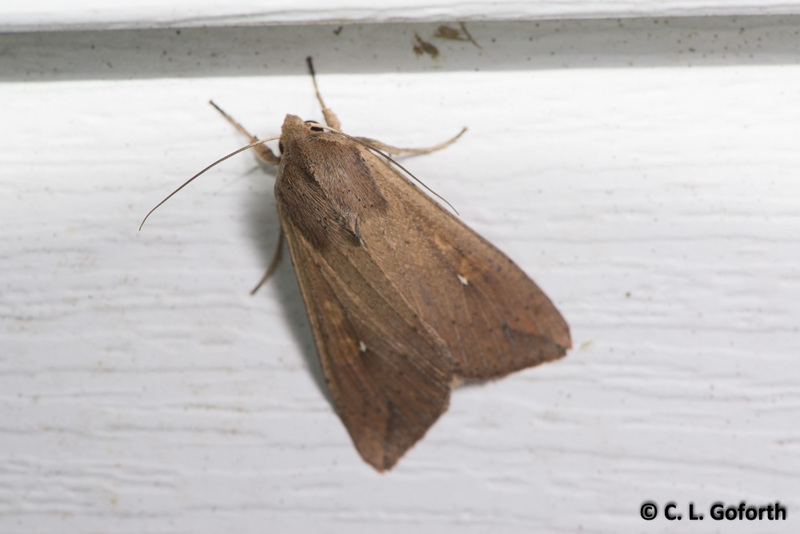 According to BugGuide, this group of insects does come to lights at night, but it’s rarely seen or collected. 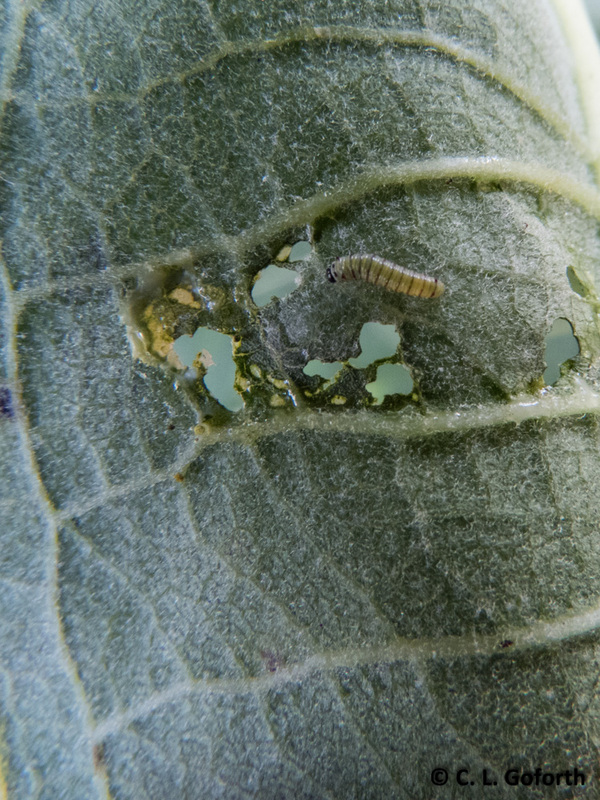 The larvae are apparently thought to feed on beetles under bark, but there’s no mention of what the adults feed on. I kinda felt like I should catch it and add it to my collection since it may be the only one I ever see, but I eventually decided against it. I don’t have a scientific reason to collect any more, so I just watched it for a while and it eventually flew away. I’m happy with just having photos of it. This find totally made my entire National Moth Week! 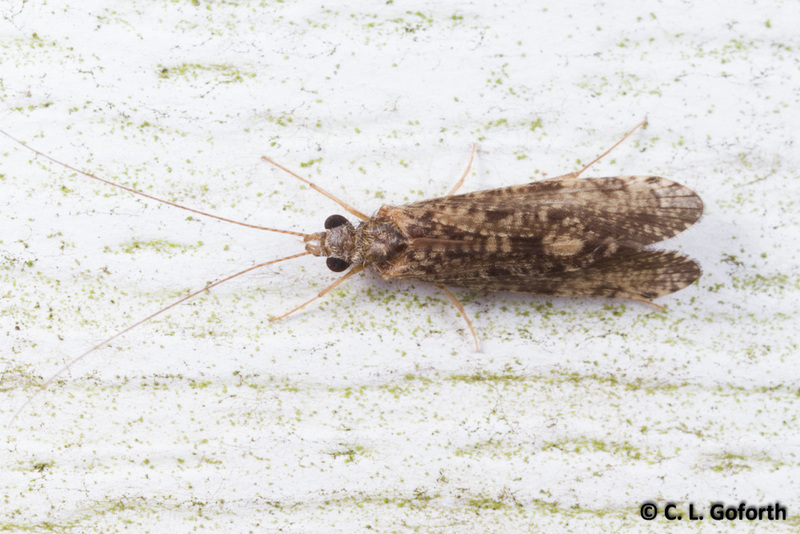 If the pleasing lacewing had been the only thing I saw the entire week I still would have walked away happy. Love getting to see/learn about new things, especially things that are entirely new. I love rosy maple moths! 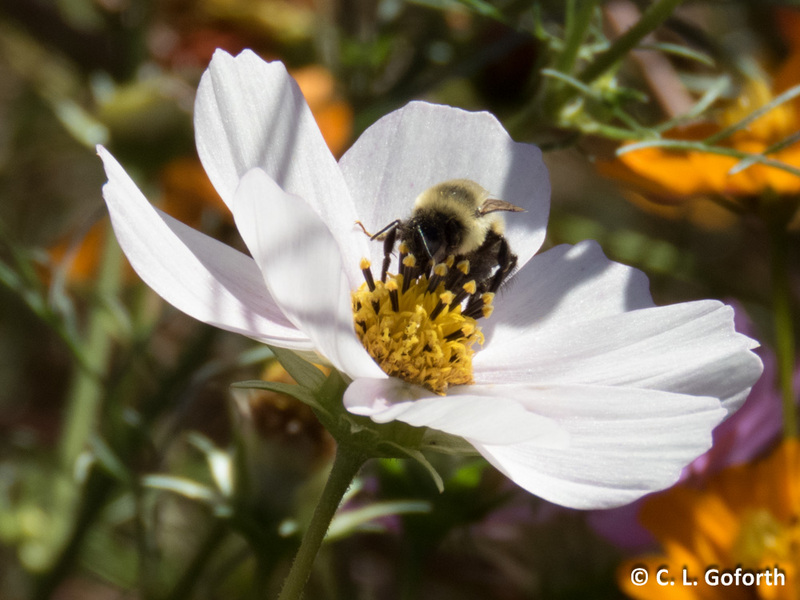 They’re super common in my area, but they’re so fuzzy and gaudily colored that it’s hard not to adore them. 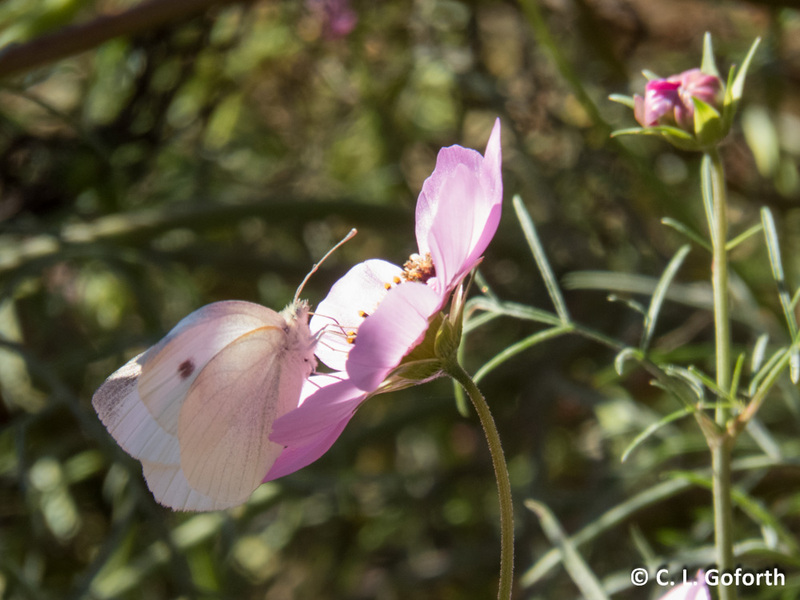 This one had something weird going on on one of its wings (you can see the black markings on the hind wing on the left side of the photo – that’s not normal), but it let me handle it. That meant I could get a good shot of its face, which I thoroughly enjoy doing. I snapped away and it eventually wiggled around into the position in the photo above, letting me get a dead on shot of its face. Look at all that fuzz! All that pink! Those amazing antennae! This immediately became my favorite photo of NMW. 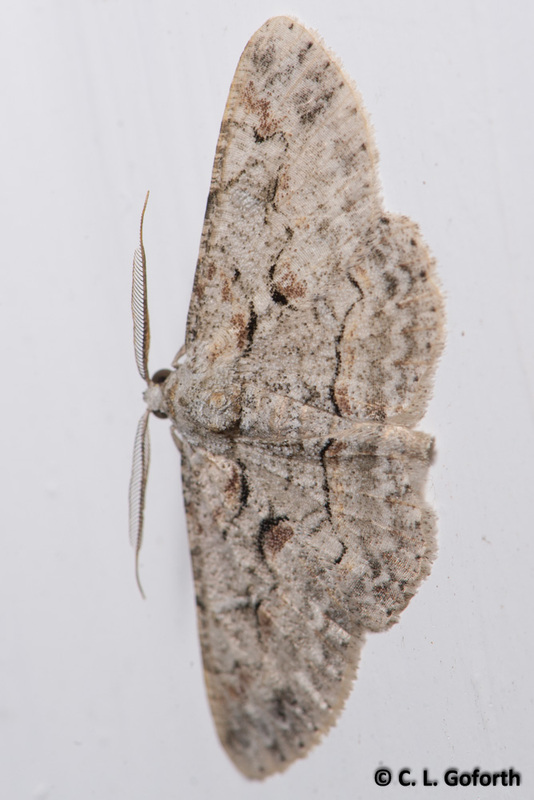 I spent the last few days of the event attempting to get similar head shots of other moths, but none of them worked out quite as well (i.e., didn’t amuse me as much) as this one. And with that, I am done posting about National Moth Week! I have so many other things I want to write about still, so I am hoping I can keep this momentum going a little while longer. I still have an entire year’s worth of Dragonfly Swarm Project info/data to post too! Look for more posts soon! bycatch (n.): the accidental capture of non-target species. This term originated in the marine fishing industry, but has expanded to include other non-target species captured in other forms of collecting or harvesting. 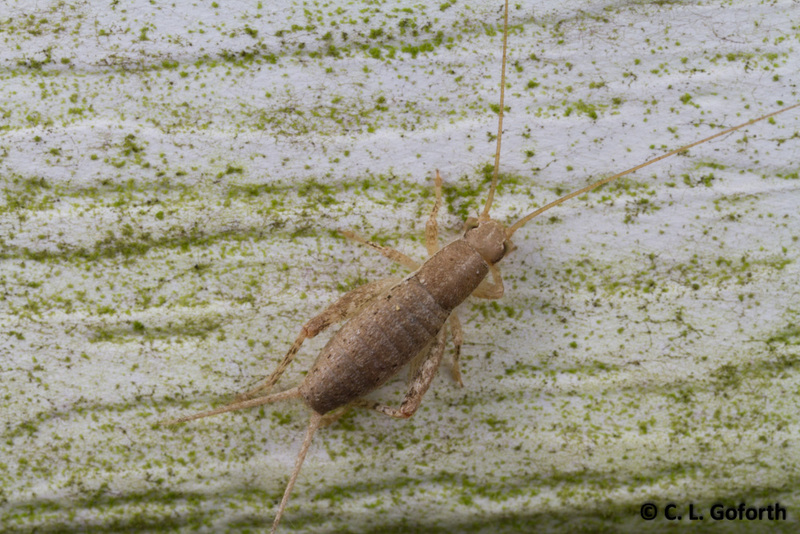 That’s a common scaly cricket immature (on my siding that’s clearly in need of a good powerwash to remove the algae!). These are supposed to live on bushes or under debris near water, so I can only presume that they are taking advantage of the low spot in my yard that’s almost always sopping wet. I love the shape of these crickets, just a little different from the standard cricket body plan. This one is pretty dark compared to most of the scaly crickets I see too – the ones in my yard tend to be white and just a little translucent. 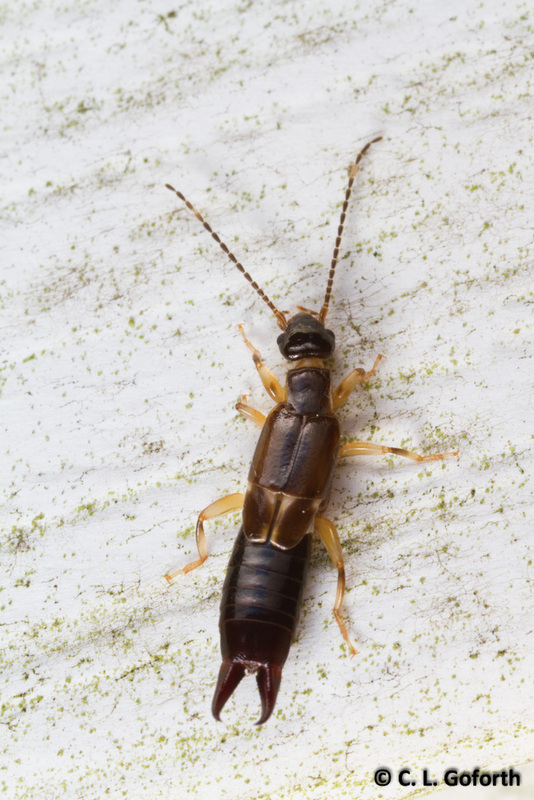 Depending on the species, and I don’t know which one this is, earwigs can eat plants, decaying organic matter, or insect prey. I didn’t see this one hunt at the lights as many other carnivorous insects and spiders do, so I suspect it might be a plant or humus eater rather than a predator. We all know and love (to hate) cockroaches! 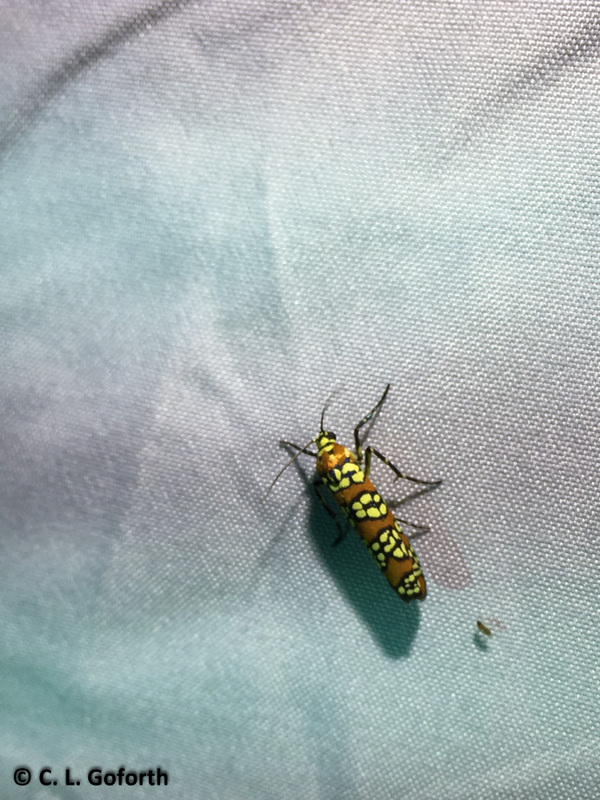 I found loads of them near my lights this year. I suspect they’re coming out of the storm sewer drain in front of my house. 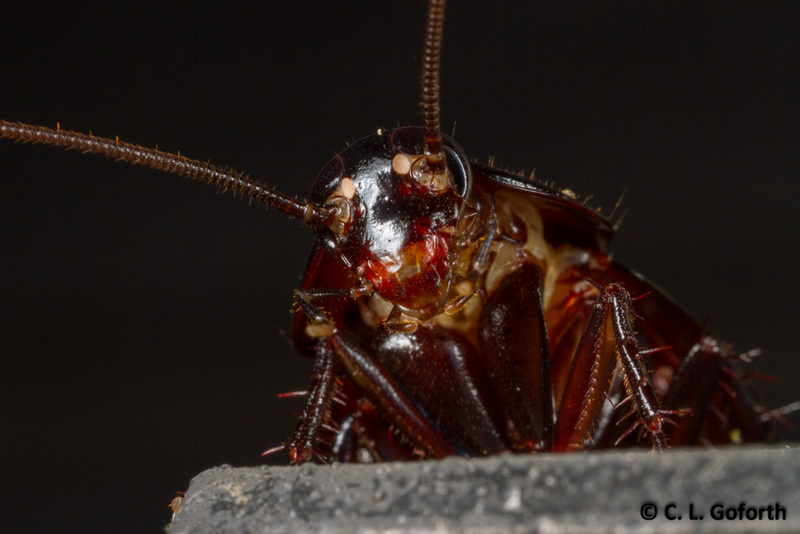 This particular roach was looking down at me from the porch light by my front door, so I got a good look at its face for once. Normally that’s tucked away below the plate-like front section of the thorax, the prothorax, where it’s hard to see. 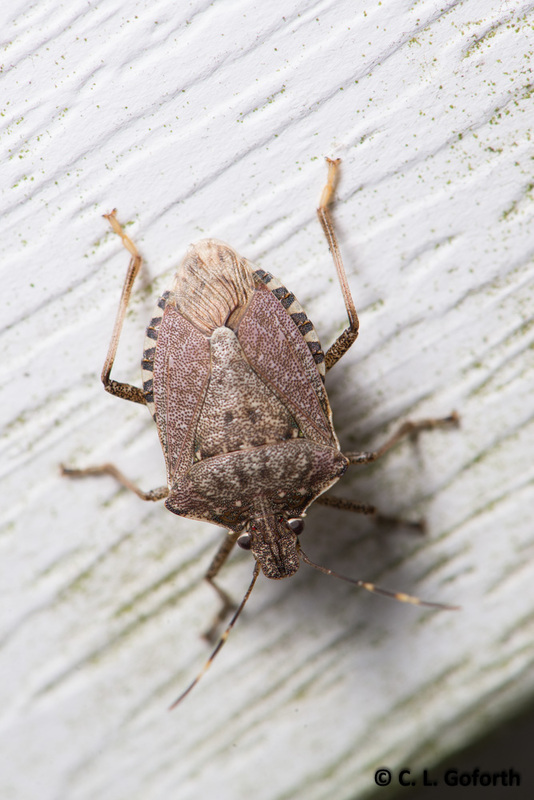 Brown marmorated stink bugs are invasive in the US and can invade homes in pretty large numbers. As you might imagine, the scent of many stink bugs together in one place is none too pleasant! 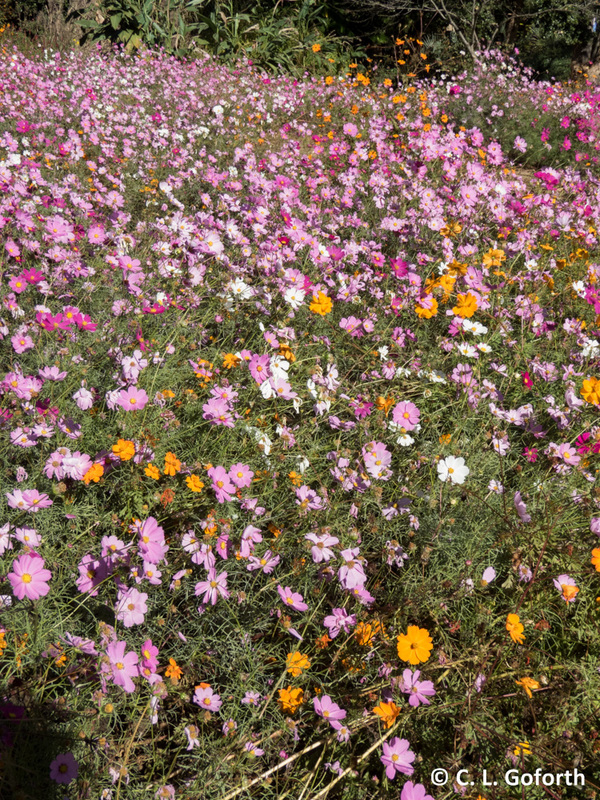 These also feed on a variety of fruit and vegetable crops, so they’re not popular with farmers and gardeners either. However, in spite of the problems they cause, I think they’re rather elegant looking bugs. The coloration and pattern are subtle, but sort of pretty too. That’s a two-lined spittle bug. They get their name from the foamy secretions they excrete as they feed as immatures. If you’ve ever seen something that looks like a wad of foamy spit hanging off a plant, you may be looking at spittle bug secretions! 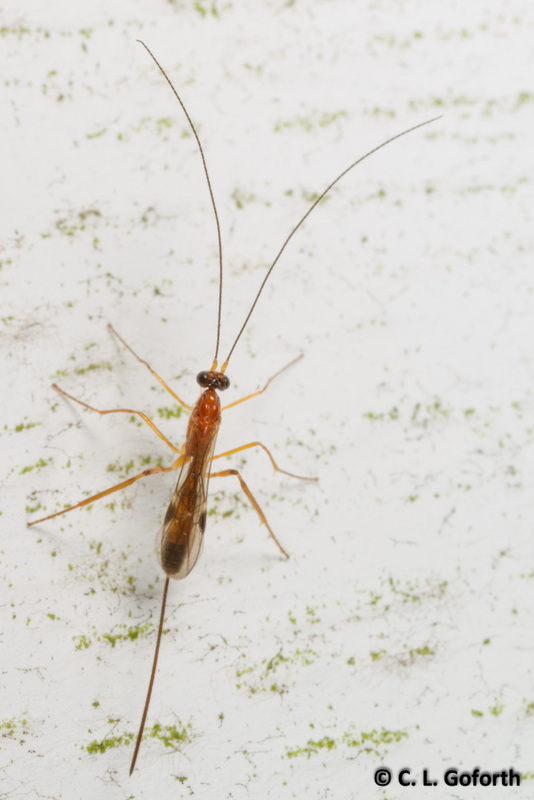 They’re considered turfgrass pests, so people who care about their lawns often despise spittle bug nymphs. 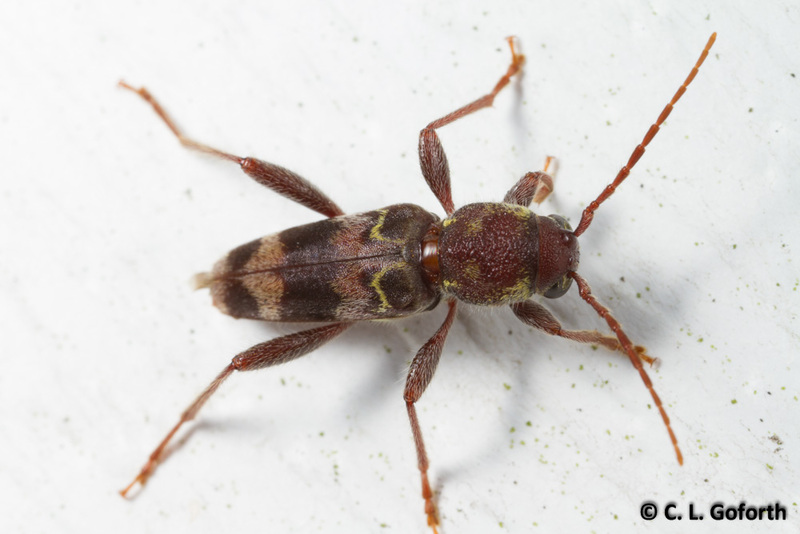 Me, I’d rather have bugs than healthy grass, so I love having spittle bugs in my weedy lawn! That’s a rustic borer. 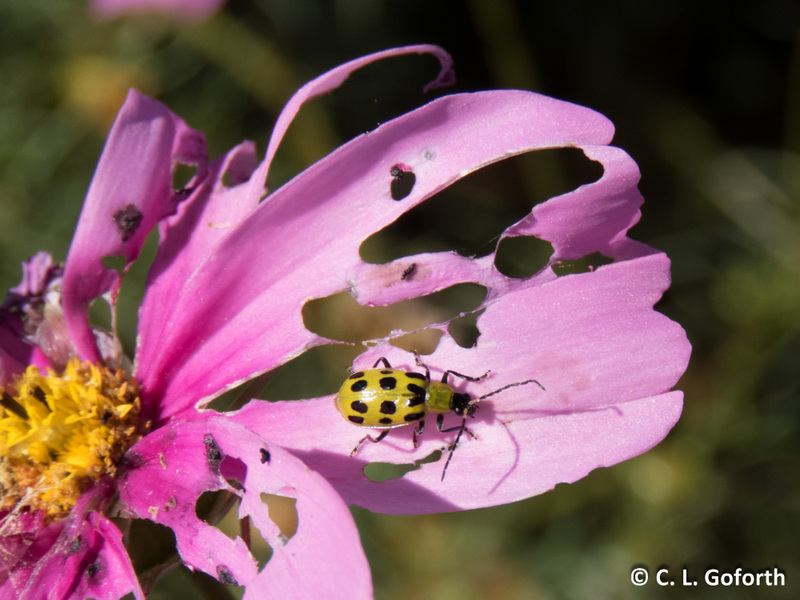 It’s actually a common beetle at lights in North Carolina, but I rarely see them in my yard. They a borer beetles, so their larvae grow inside of trees. 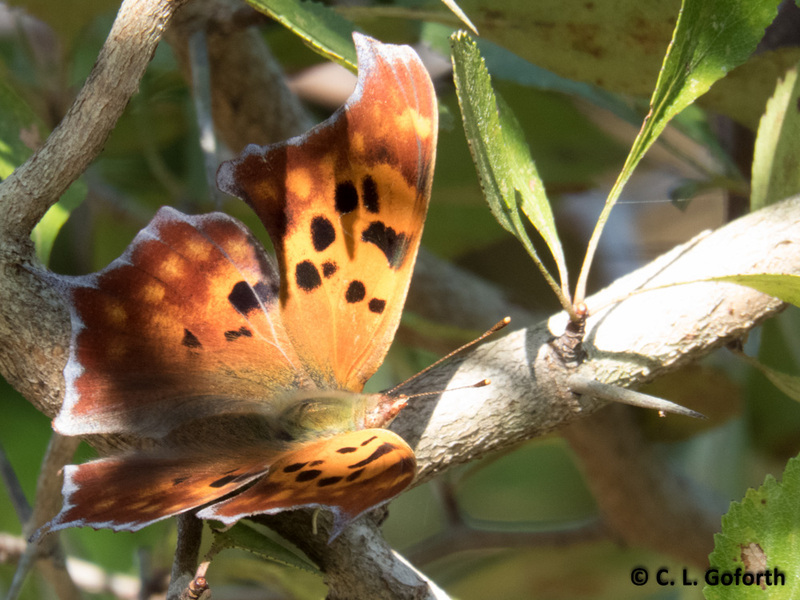 They’re not very picky – almost any hardwood tree will do for this species. No idea what this one is, but I like the way it looks, thus I’m including it here. 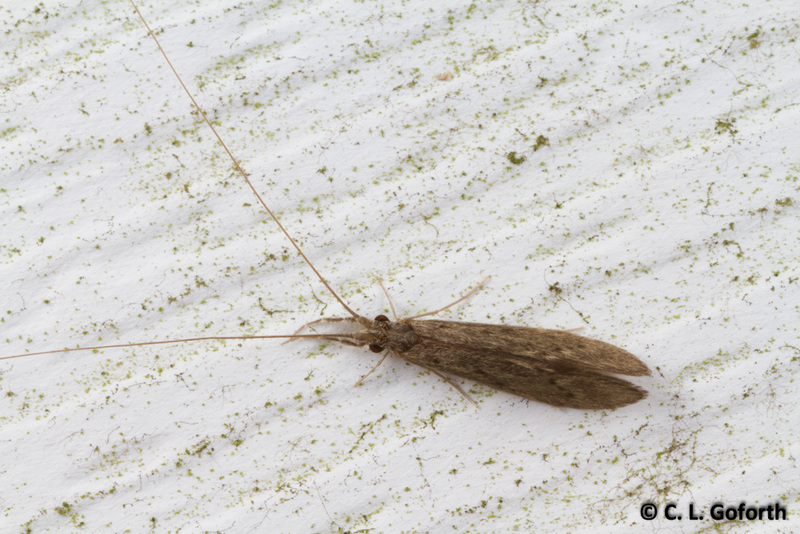 I can ID aquatic caddisfly larvae easily enough, but once they’re adults they honestly all look about the same to me… Someday I’ll at least learn my caddisfly adults to family! And finally, we come to the flies! 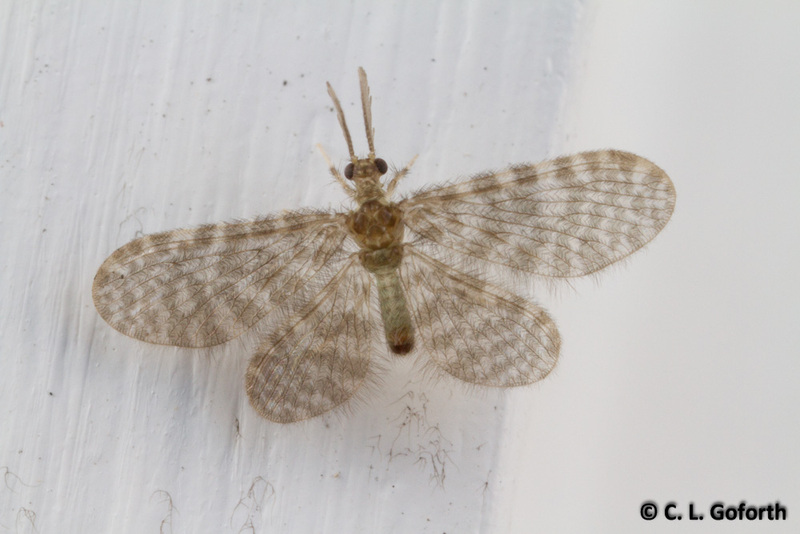 Moths flies are called drain flies as larvae as they are often found living in the water trapped in the U bends of drains in locker rooms, hospitals, bathrooms, and other places where skin cells and other human waste gets trapped in little nasty puddles of water. 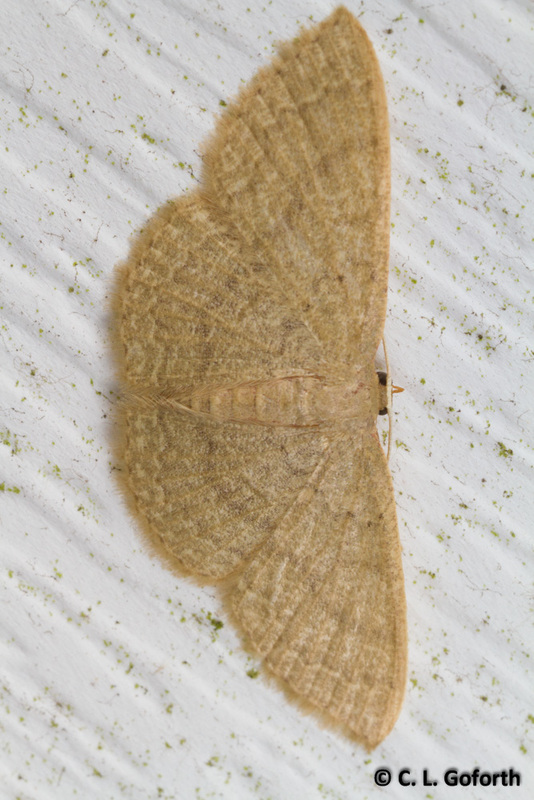 The larvae are actually rather interesting looking, but the adults are downright adorable! They’re tiny, but oh so fluffy. I just love them! I suspect these might be coming from the storm drain as I tend to see a lot of them at lights at night outside my house. 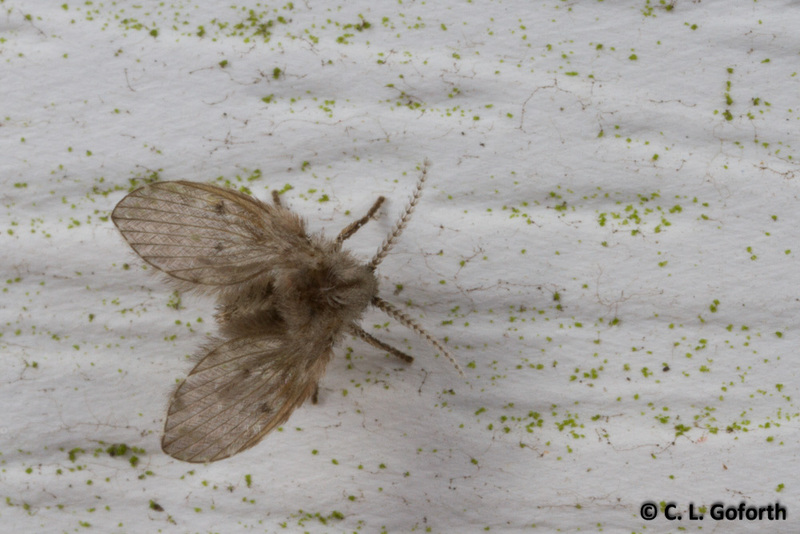 I don’t care how gross they are – I am always happy to see a moth fly! This is a species that’s non-native in the US, but we don’t know much about it still. 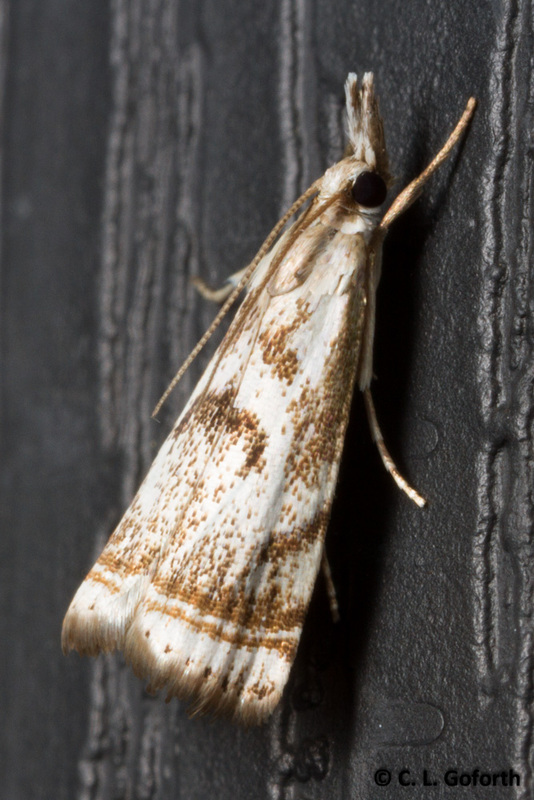 It’s a very pretty moth though, if you can get a close enough look at its very small body! None of these are particularly showy moths, but they are readily abundant in my yard and among the most common species I see. You’ll notice that most of the common species I see feed on grasses as caterpillars. 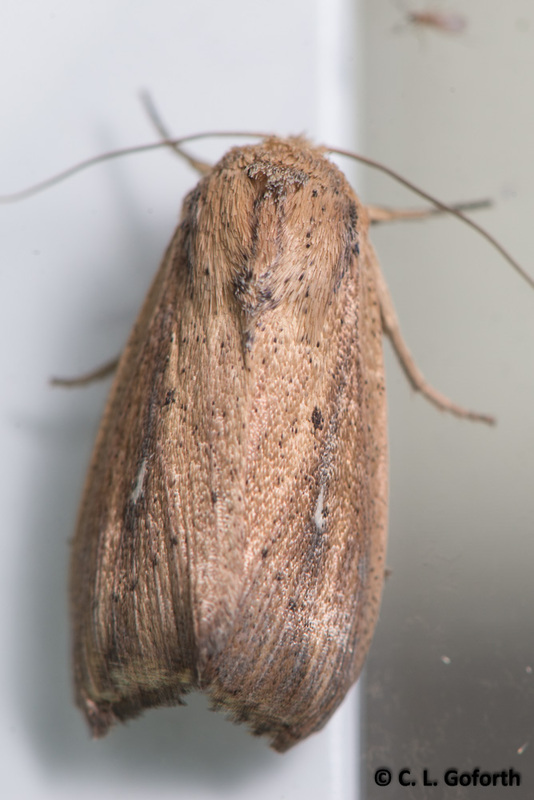 Given the amount of grass in my yard, it probably explains why I see so very many of these species at my lights. I can’t find much information about this species, but it’s awfully pretty. Some close relatives of this group of moths make up the majority of the aquatic moth species, so I wonder if these might not be taking advantage of plants in the soggy part of my yard. No idea why it was posed that way, but it did fly away at some point and was not in fact dead. 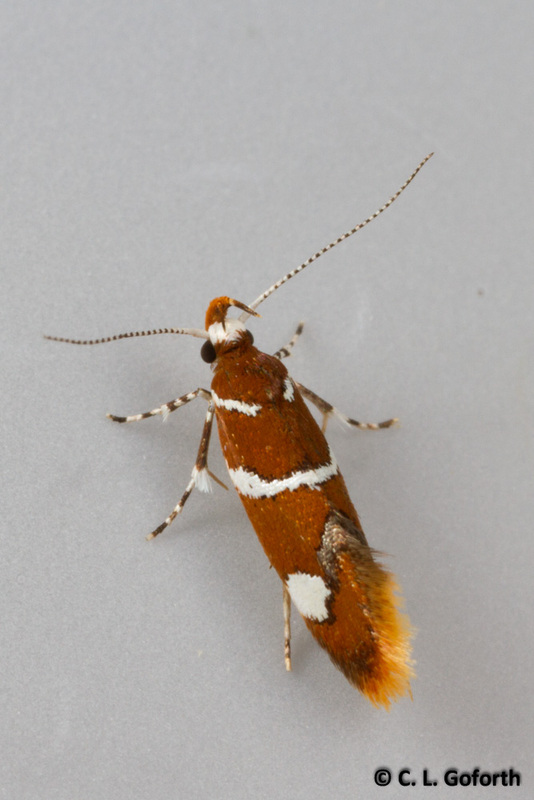 This species could be feeding on my maple trees and it has an awesome caterpillar that is covered in stinging hairs. It’s fun that a nasty caterpillar turns into such a plush, cuddly moth! 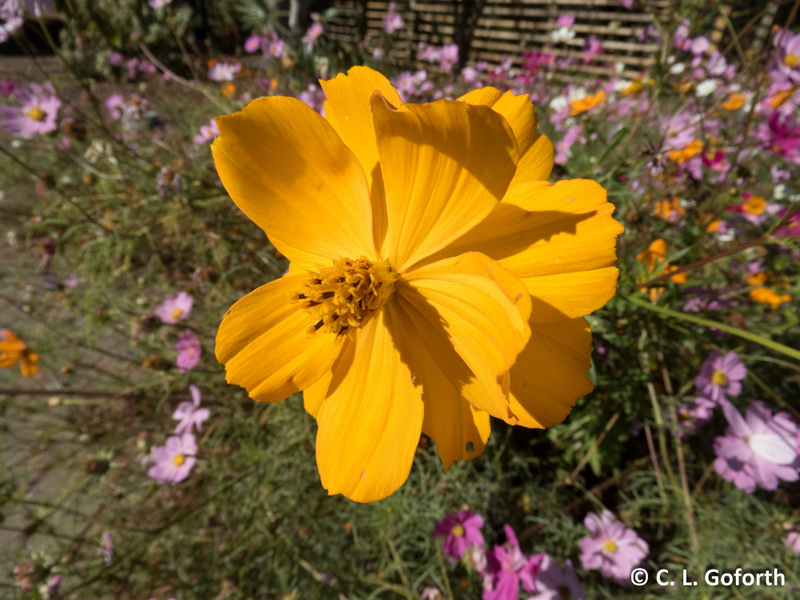 No idea where this might have come from, but perhaps a neighbor’s garden where it can feed on a variety of crop plants (including tomatoes and squash) and ornamental flowers. I loved the elegant, subtle patterns on its wings! These are also called armyworms, apparently based on their habit of eating plants down to the ground and then marching to another area to continue feeding. They’re generalist feeders and can be pesty. It was bigger than it looks in the photo, and I loved the striped pattern on the wings. No bright colors or anything, but still very pretty. My best find, however, didn’t sit still long enough for me to get more than a glance at it before it flew off. 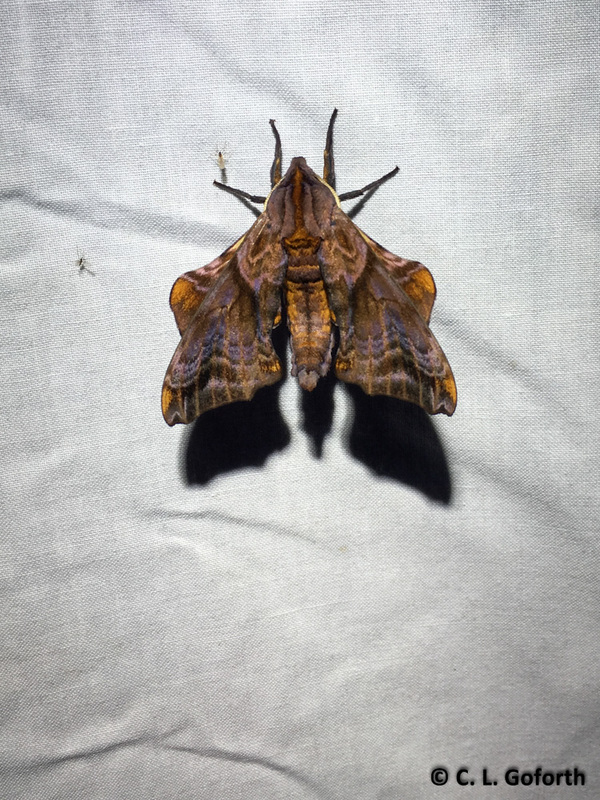 It was a five spotted hawkmoth, a giant, powerful beast of a moth. I was taking a photo of something else when it slammed into the back of my head. Scared me badly enough that I shrieked loudly (so embarrassing!) and then it fluttered around outside of the light for a good five minutes before it landed just long enough for me to see what it was. 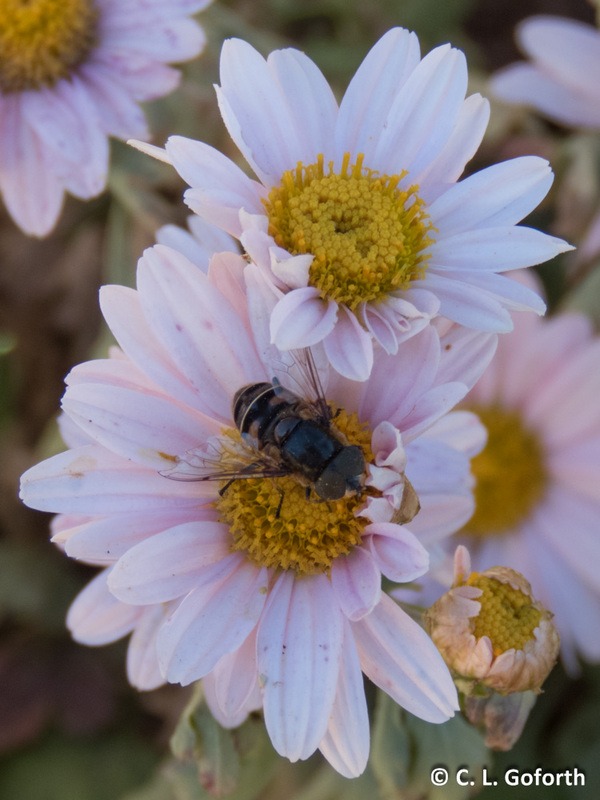 I lifted my camera, but it flew right into my face, smacked my cheek with its wings a few times, and then flew away. Wow, such a gorgeous moth! And so scary when you don’t expect to have something the size of a small bat silently fly into your head at a high speed in the middle of the night! Of course, you don’t see only moths when you blacklight! 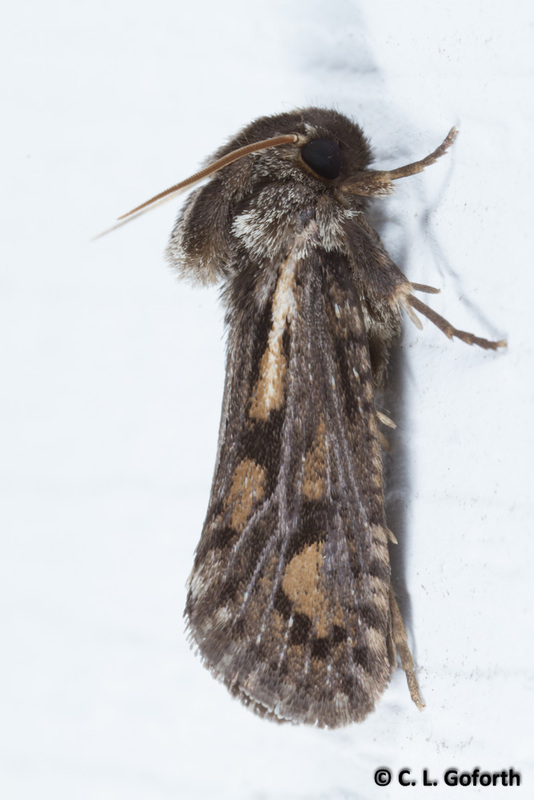 My next post will feature the “bycatch” from National Moth Week, the non-target insects that also came to my lights. I got a bunch of the same old things I always get, but this year I also got a few exciting new things that I can’t wait to share! Hey everyone! Haven’t been able to spend much time on my computer at home for a long time, but I’ve been dying to share several things with you all. 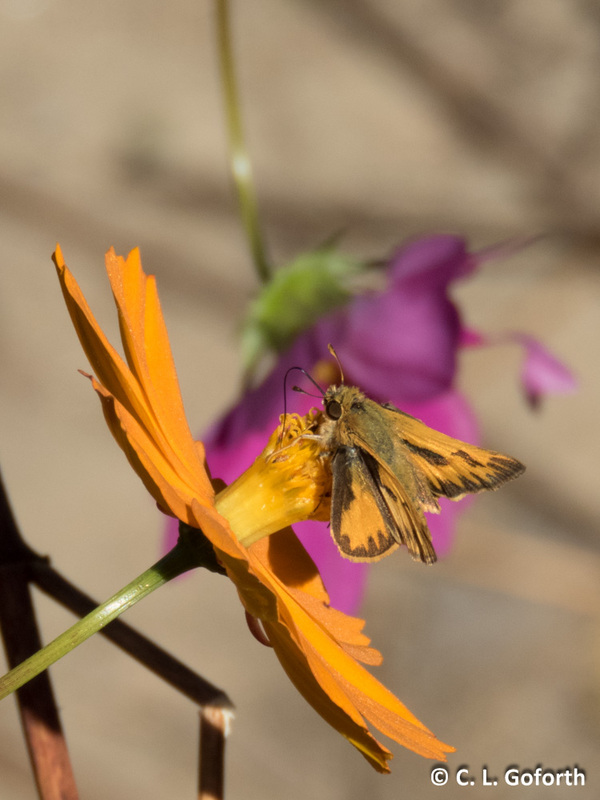 The next few posts will feature my favorite insect-themed celebration of the year, National Moth Week. I LOVE Moth Week! 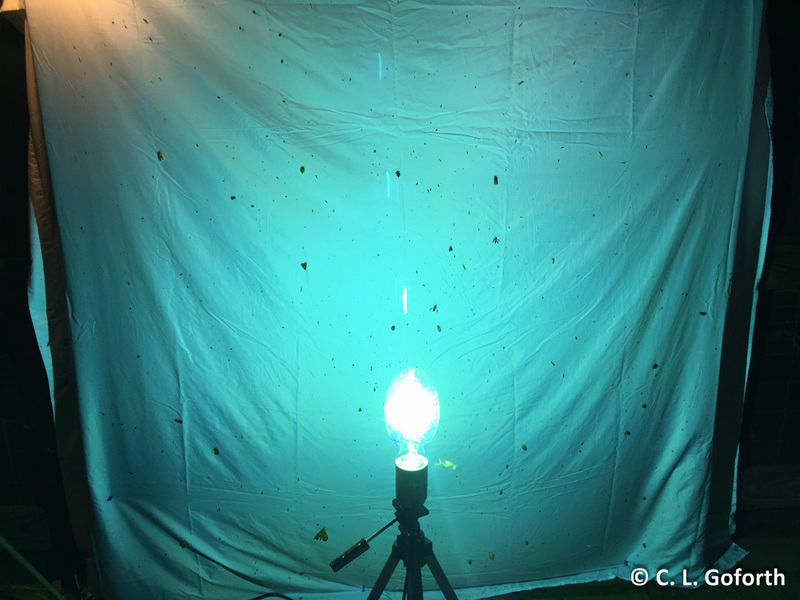 I’ve hosted a big moth-themed open house at the museum field station where I work every year since National Moth Week started and then I go out every night that week and blacklight at home. For my public event, I bring my blacklights, bait, and my brand new mercury vapor light (so, so happy to have it!) to attract moths. Usually, there’s some freak storm the day of my public event that sends everyone running for cover, but we lucked out and got no rain at all this year. About 55 people came, and they were a marvelous group! 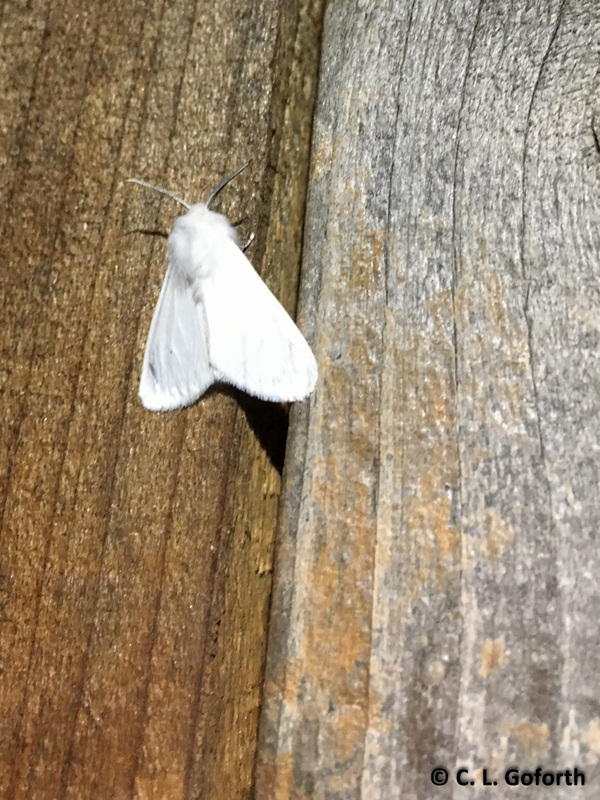 It was a punishingly hot day and it stayed hot well into the evening, but those 55 people were enthusiastic and very excited about getting to see moths and other nighttime insects. No complaints at all. So. Much. Fun!! 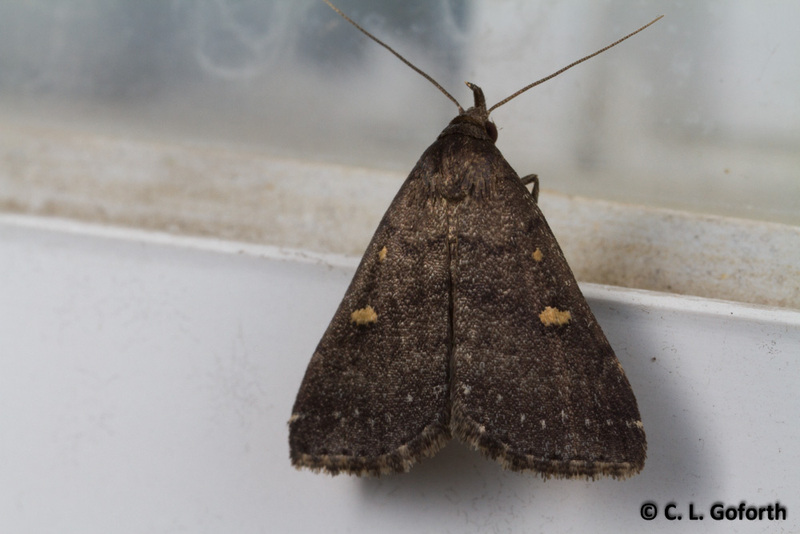 I usually bring my Nikon DSLR camera with me to my public moth event and start taking pictures when things calm down after most of the visitors have left for the evening. 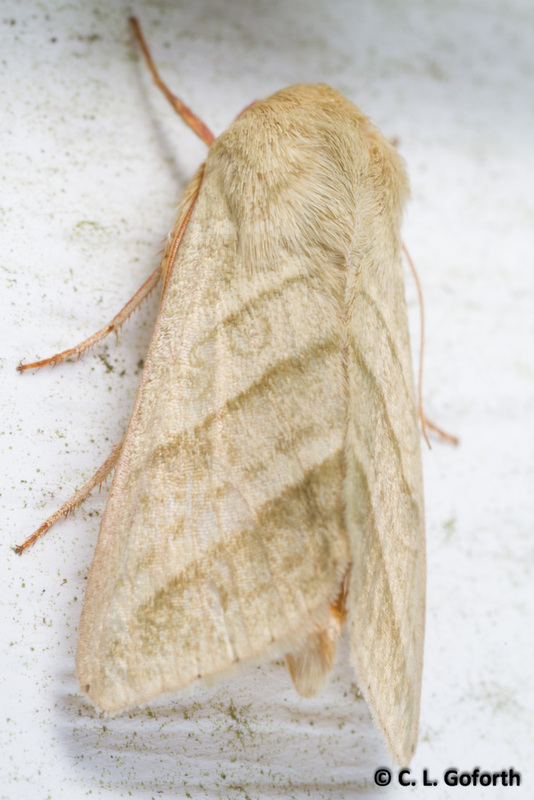 We never get many big moths, so this year I brought my Canon with my super close up MP-E 65 lens so I could get good photos of the smaller moths. I pulled it out about 10:30pm, got my flashes set up and the diffusers in place, strapped my headlamp onto my head, and was about to get started photographing our far-better-than-average moth haul for the evening when I realized my battery was dead – and my spare AND my charger were plugged into the wall at home. Doh! I ended up taking all my photos with my headlamp and phone this year. 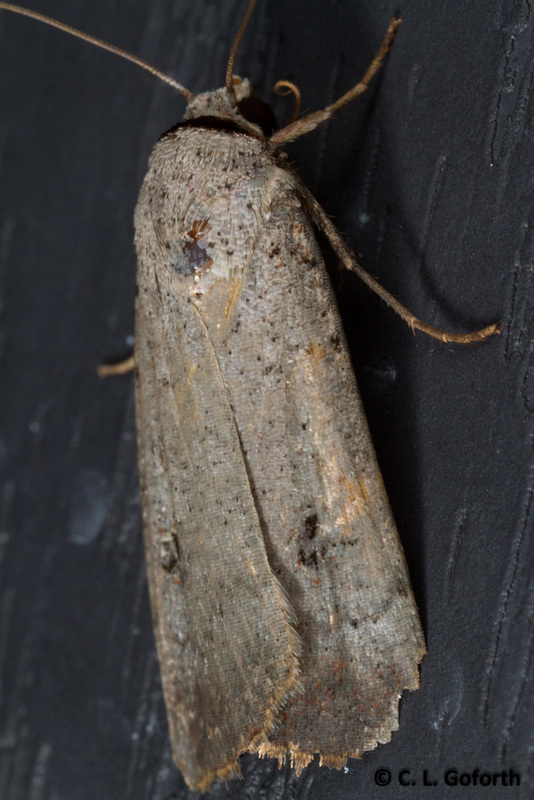 However, given the large size of several of the moths that showed up, my camera choice was a mistake anyway. One on each side of the building. I kept things easy and just thumbtacked the sheets to two of the wooden walls of the building, and set a couple more up on the PVC frames I normally use. 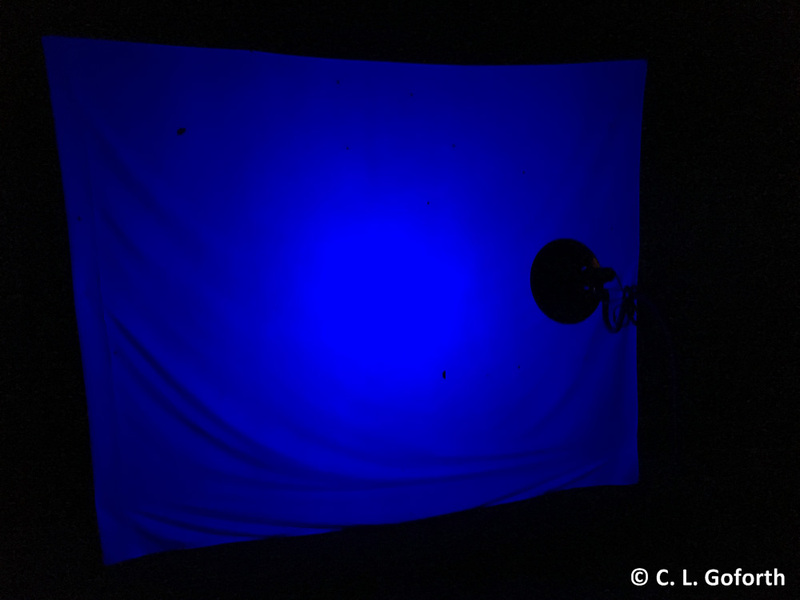 I have had the very fortunate experience of blacklighting in southern Arizona during the monsoon, where this sheet would be absolutely packed with insects, including many very large moths. 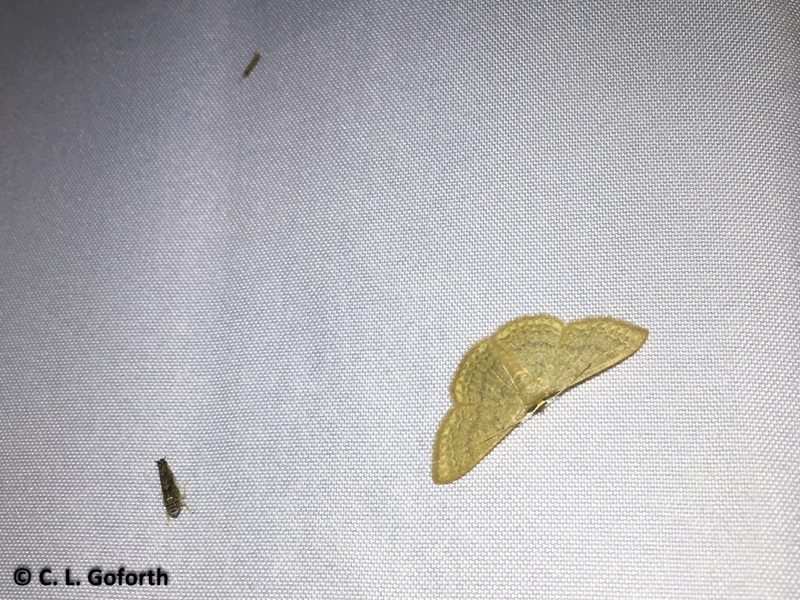 However, this is a really good haul for this particular location, probably the most moths I’ve ever gotten on a sheet during National Moth Week. This is the second time I’ve seen Hebrews at this event. I just love them! 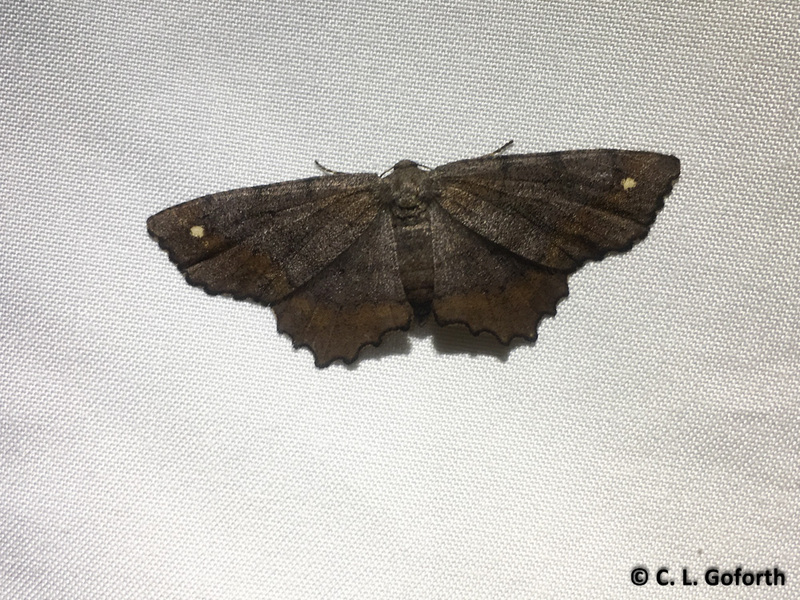 I gave a little talk about moths during the event that included photos of some moths we’ve seen in past years. Conveniently, all the moths above were included, so it was a lot of fun listening to people exclaim over moths they recognized from the presentation! People saying, “Ooh, look! It’s an elegant grass veneer!” or “Oh, oh! 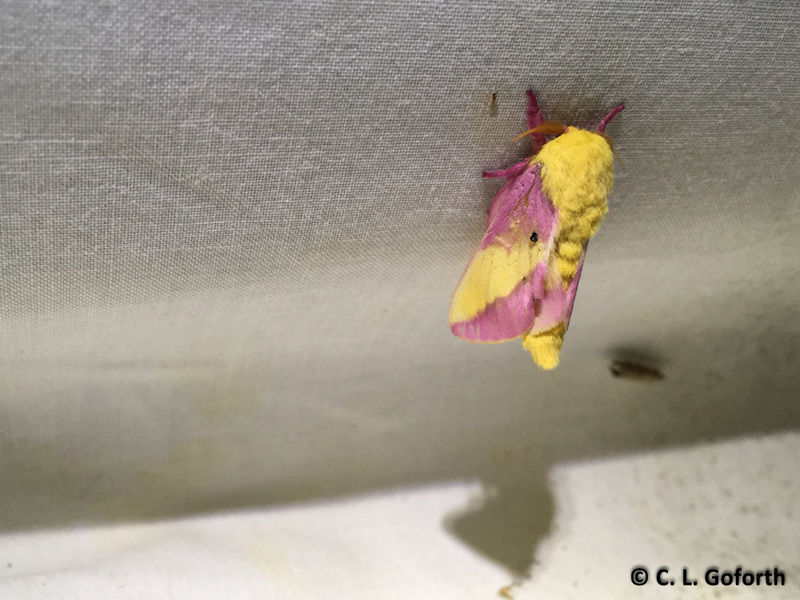 It’s a rainbow sherbet moth. 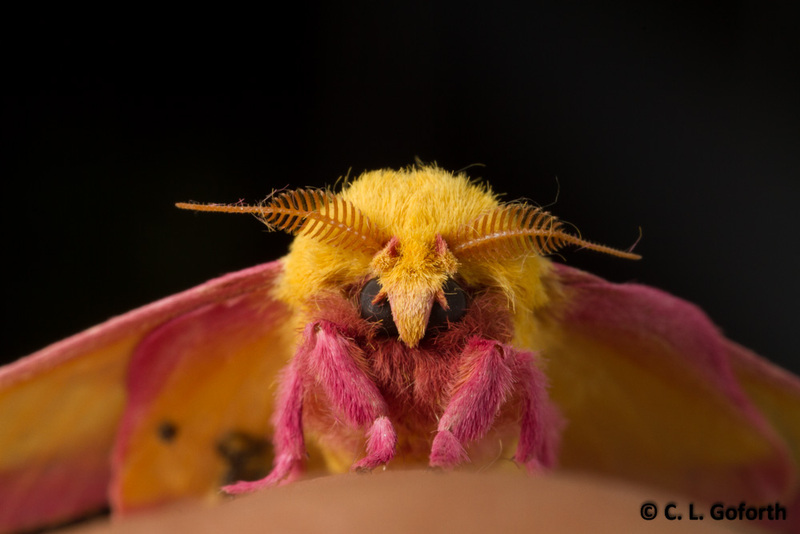 What was the real name, rosy maple moth?” I felt like people were walking away from the event knowing a few moth species they might not have known before because they saw them on a big screen and then immediately saw them in real life at the lights. Very nice to be able to provide the moths I shared in the presentation on command! 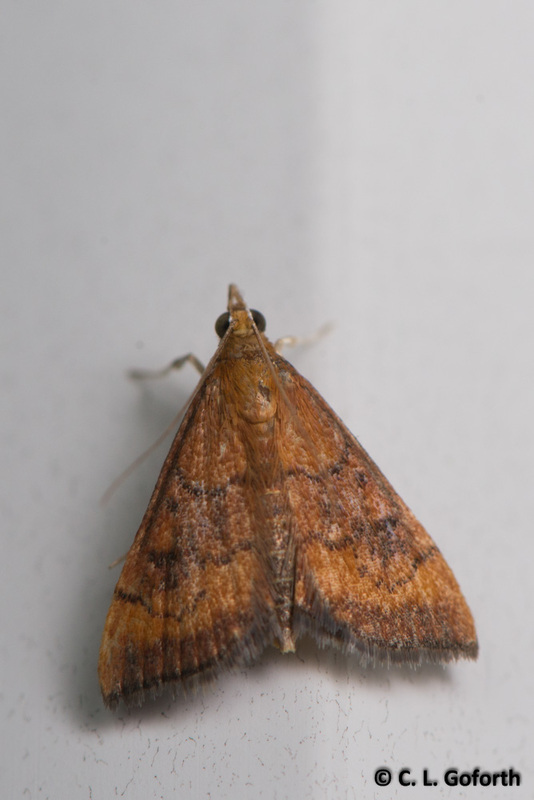 Might be an oblique banded leafroller? 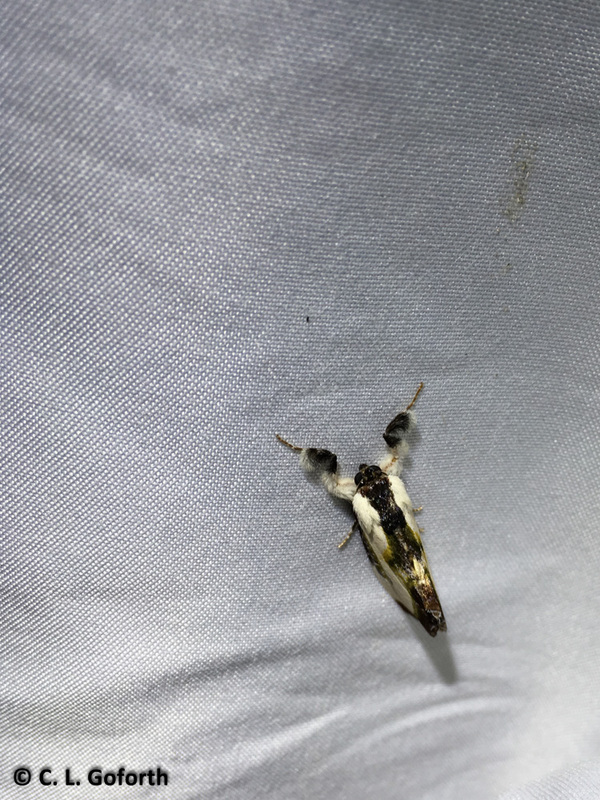 I’m still learning my moths, and these little ones are definitely not easy. Everyone had left and I was just getting ready to take down my lights when this moth showed up. I was thrilled! Such a gorgeous moth. Shiny, velvety, perfect. I really regretted not bringing my Nikon DSLR so I could get better photos of this stunner. 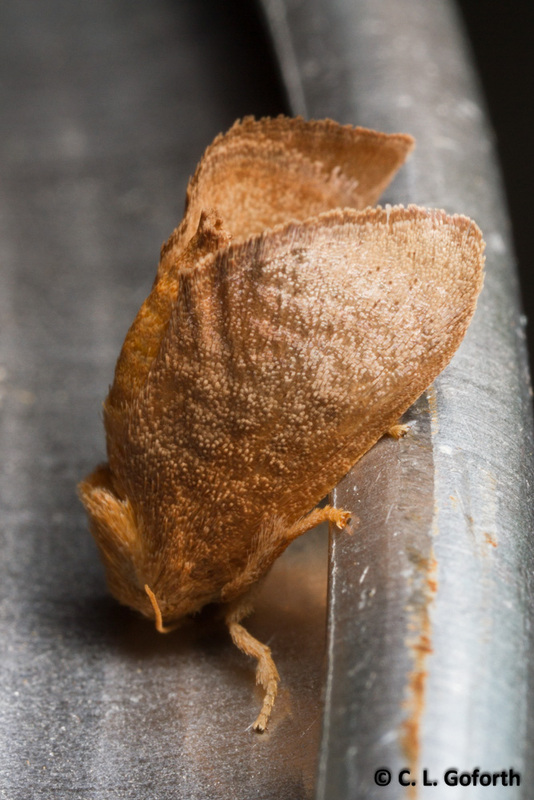 The whole night was great, but this moth made the oppressive heat and having to take all my gear back down alone after midnight absolutely worth it. This particular event takes a lot of setup and takedown on my part, but I absolutely love it! 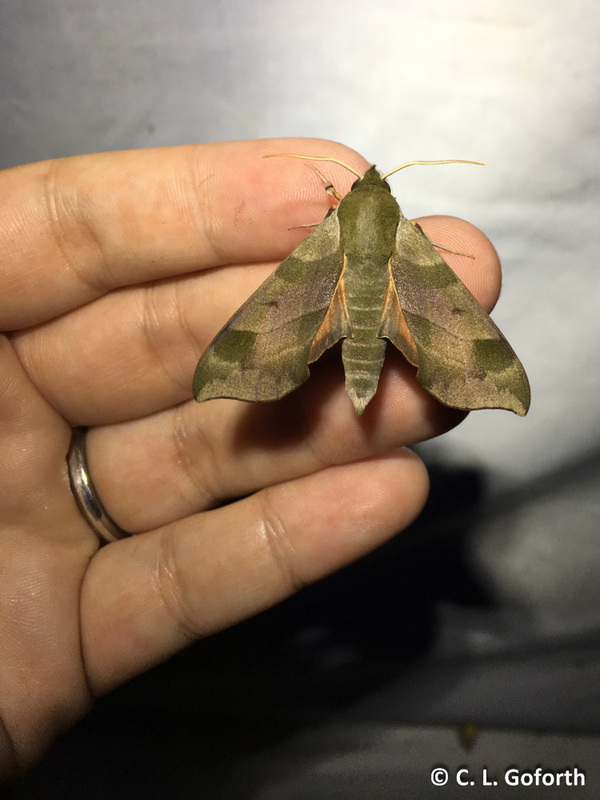 Every year I get good people who are excited to learn about moths and other nighttime insects and every year I leave work around 1AM sweaty and exhausted and completely happy. What’s better than hanging out at a light looking at bugs with interested people all night? 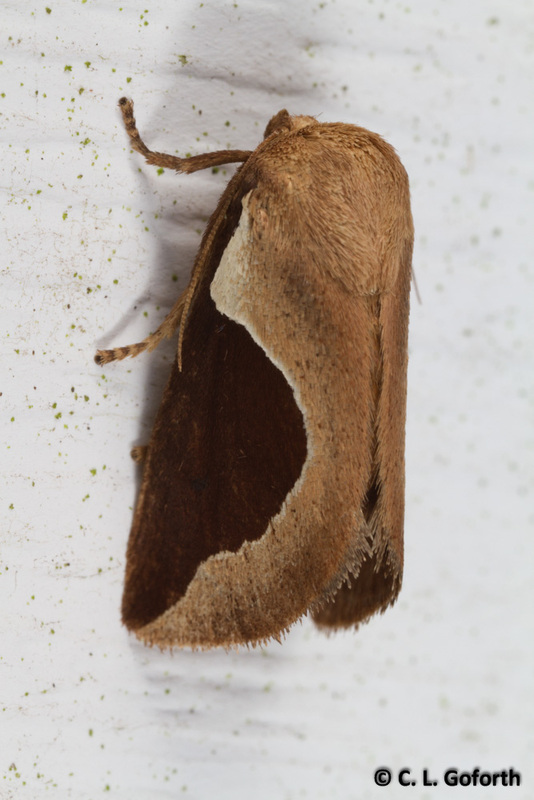 I’m going to post a few more posts about National Moth Week soon, so be on the lookout for those! 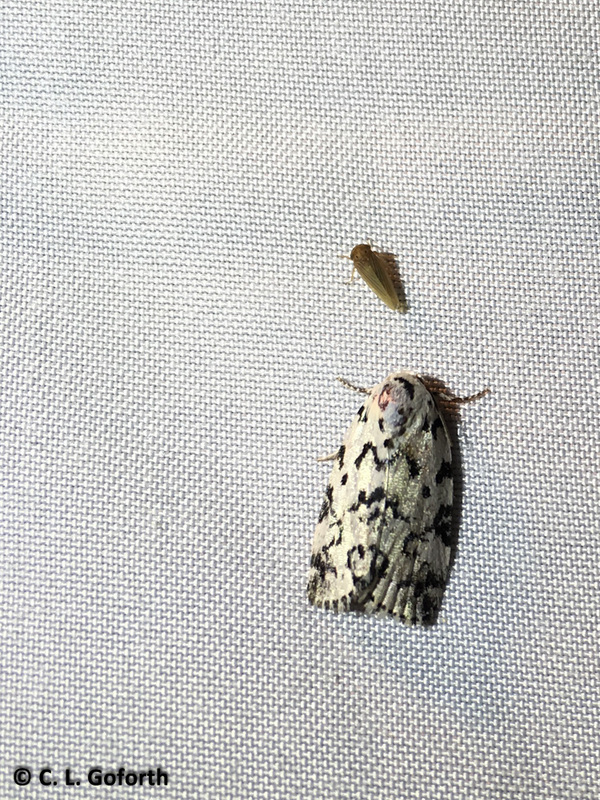 One will feature the moths I found in my yard that week and the other will be about the other insects I found while looking for moths. Hope you’ll enjoy them!